Mt. Etna, I Heart you! The power of Mt. Etna… image from Treehugger, taken in October of 2009. I have an unnatural fondness for the wine of Mount Etna. I was thinking about this the other day while pouring wine for an amazing Sicilian Wine Fest at the Wine House in Los Angeles. 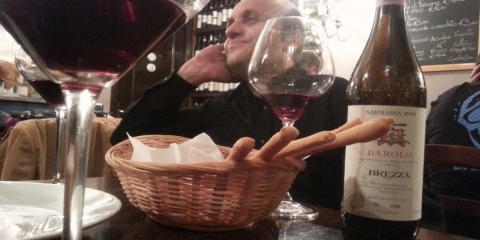 I love Etna wines pretty much more than any other Italian wines. Mostly I think I love the idea of Etna- the volcano, threatening to errupt any day, could (and has) destroyed vineyards, homes, roads and anything else in its path. However it also gives life to the soil, creating a terroir rich in minerals, nutrients and ash. When you pair that with the unnaturally high vineyards and amazing exposure throughout the area you get some pretty extreme and elegant wines. Dottore Benanti & Joanie Karapetian- Great times! If you are interested in geeky Italian wines, you must add Benanti to your list of wines to try. These are still semi-undiscovered, lovely gems that certified Italian wine people love… just take a look at this mention of Benanti’s “Single Varietal” Monvitigno Nerello Mascalese by Jeremy Parzen. Etna wines range in price from VERY affordable, to Less Affordable (but MUCH more affordable than they have a right to be!). Start with an Etna Rosso or an Etna Bianco- you’ll be shocked by how different these are from the pruny, jammy Nero d’Avola and rich Sicilian Syrah you might have tried before. This is an entirely new side of the volcano! But will they drink Carricante in Newport Beach? Welcome to the OC, Mozza. had a chance to try Benanti, thanks to Dr. J – – and agreed, one of my current faves. JP is so amazing like that! Spreading the Good Word far and wide! Thanks! So glad you liked it. This month’s issue of Food & Wine has a great spread about Mt. Etna as well… I hope you go out and find some of these wines to try! Hello everyone! We started blogging only this year so we’re still trying to catch up with all blog material of us. But it fills our hearts with joy to read your comments and articles! congrats for your work and keep it up!